« “Going to hell in a handbasket” … say, what? Math Trix: So, exactly how lucky is Hillary? I know that this doesn’t matter from a political perspective… Bernie stands zero chance of winning the nomination. But I think that the math is interesting … made me dust off my recollections of combinatorial probabilities. Just in case you’ve been asleep for the past couple of days (or get all of your news from the NY Times), Hillary squeaked by Bernie in Iowa … I mean, really squeaked. The ending tally was that Hillary got credit for 701 delegates and Bernie got credit for 697. How those final totals were concocted is very interesting. Here’s the scoop … and the stats. Based on the raw vote tallies Bernie got 697 delegates, Hillary scored 695 and there were 6 ties. Might have expected that the ties would have been split evenly with 3 delegates going to each of the candidates. If that were the case, Bernie would have ended with 700 and Hillary with 698 … Bernie wins. But, the Iowa Democratic Party had a different idea: flip a coin for each of the tied delegates individually and give the ‘whole delegate’ to the candidate winning the toss. So, they flipped 6 times and Hillary won all 6 coin flips. Easy … two possible outcomes (heads or tails) … 6 tries … just multiply 2 x 2 x 2 x 2 x 2 x2 = 64 … odds are 1 in 64 … probability of 1.6%. Let’s cut the data another way …. Given that Bernie had a 2 delegate lead before the tosses, what were the statistical probabilities that he’d prevail. Here’s the stats recap, below is the explanation. Sum up those probabilities and Bernie stood a 65.5% chance of winning. 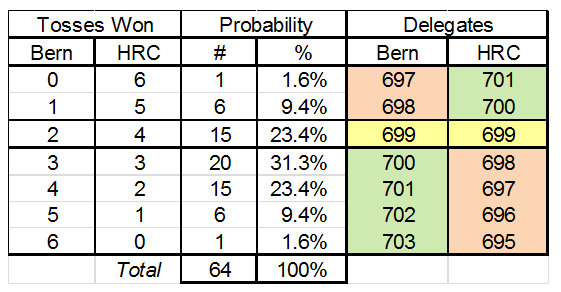 The was a 23.4% chance that Bernie would win 2 and Hillary would win 4 … resulting in a 699 tie. So, Hillary’s probability of winning was 10.9% (100% less 65.5% Bernie wins and 23.4% tie). In other words, Hillary got very lucky on Monday night. P.S. Does anybody find it curious the the Iowa Democratic is “unable” to release the raw vote totals? Since I love conspiracy theories, gotta believe that Bernie won the popular vote. Oh well, we’ll never know … info has probably been deleted. This entry was posted on February 4, 2016 at 6:59 am and is filed under 2016 Campaign, Statistics - Probabilities. You can follow any responses to this entry through the RSS 2.0 feed. You can leave a response, or trackback from your own site.